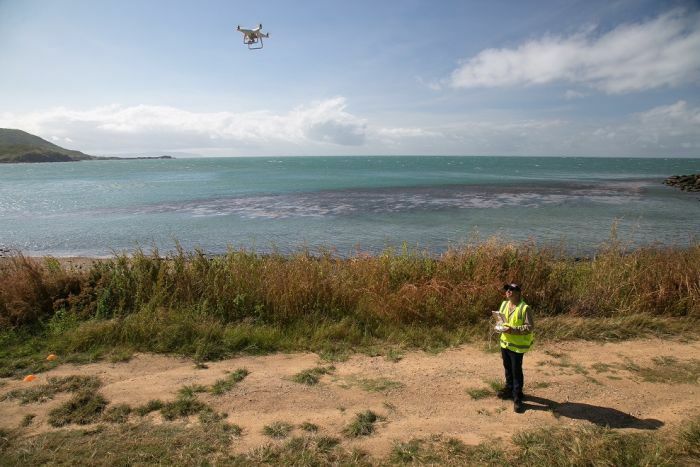 Yuku Baja Muliku Rangers in far north QLD are using drones to care for one of the most biodiverse regions on Earth, the Great Barrier Reef Marine Park. The land and sea country of the Yuku Baja Muliku people includes portions of two World Heritage-listed areas and spans an area of 22,500 hectares around Archer Point on Cape York. Archer Point is a crucial stretch of the marine highway for green turtles travelling to and from their Raine Island nesting grounds – the largest in the southern hemisphere. The waters also offer sanctuary to the threatened hawksbill turtle, as well as dugongs. With such a large area to monitor, drones have quickly become the tool of choice with the ability to map areas for a fraction of the cost involved in conventional aerial mapping. Through an initiative with the Great Barrier Reef Marine Authority, Yuku Baja Muliku Rangers have undertaken training and Civil Aviation Safety Authority (CASA) certification to use drones commercially. Yuku Baja Muliku Rangers operations manager Mick Hale said the drones allow the rangers to observe areas of the reef that are difficult to access in more detail, and monitor changes over time using photos and video. It is hoped that the drones will be used to record cultural heritage sites, and video traditional activities. “Our connection to our sea country, and respect for the animals that we share these waters with, ensures we do all we can to protect them. Our care is unwavering,” Mr Hale said.